Hakka Republic is KL’s newest bar and bistro, located on the 2nd Floor of Menara Hap Seng (the old MUI Plaza) on Jalan P Ramlee. Their chef has spent 10 years working in a Tokyo restaurant and it really shows in his subtle but creative way in food preparation. What can I say. The steamed grade 9 wagyu was exquisite. So light and soft with marbling that it literally disintegrates as it touches your tongue. Dip the wagyu in ponzu sauce and sesame sauce to take the flavour up a notch. 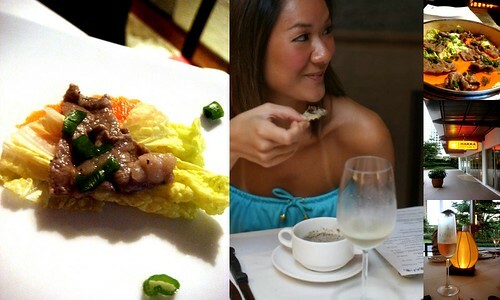 This dish is priced at RM120/100g of Grade 9 Wagyu beef. What a start to the night. Bread, bread, bread. What’s there not to like about bread? 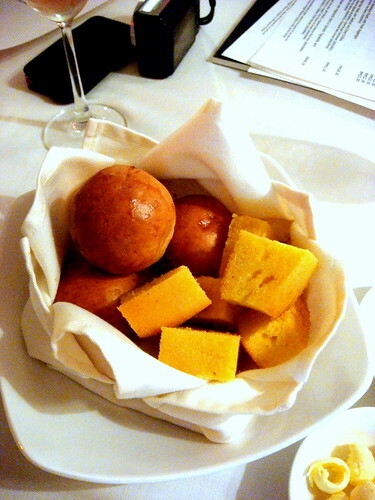 Well, Hakka Republic’s corn bread and sweet buns are freshly baked and go fantastic with either the salted butter or the olive oil they serve. These buns possess a sweeter taste over normal bread and this goes perfect with the salty edge of the butter. 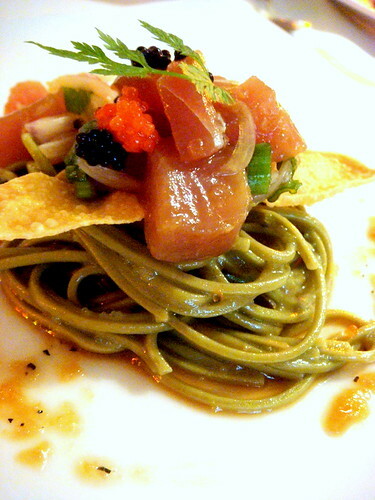 The next dish along was the Tuna Tartar with Green Tea Cold Soba was priced at only RM25 – was light and refreshing, served to whet your appetite and to really get the dining experience rolling. What is it about little swirls of pasta stacked high with fish and roe that gets my pulse pumping.. not unlike that feeling I get as I look down the running track! The things that I look for in my mushroom soups are a generous portion of fresh wild mushrooms, a tasty but not overly salty base and finally a creamy finish. 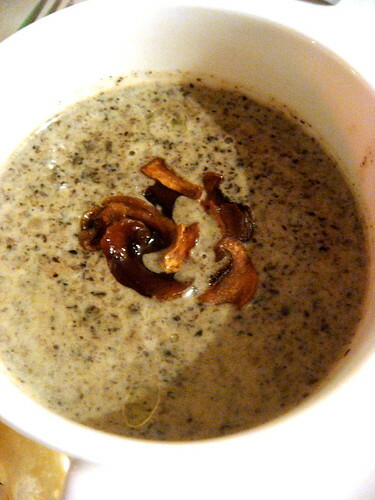 This Wild Trio Mushroom Soup with Truffle Oil had all three components. Very nicely done. (RM22 per bowl). The Ciku Sorbet! 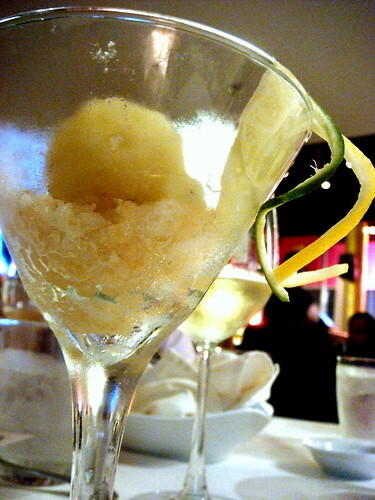 Sorbet is served as a dessert or, sometimes, between courses of a meal to refresh the palate. In this case, it was the latter. I liked the Ciku Sorbet because it was not too sour and did not give my head an immediate ‘brain freeze’. I also liked the fact that it imparted a local touch to the meal. The word Asian Fusion comes to mind. 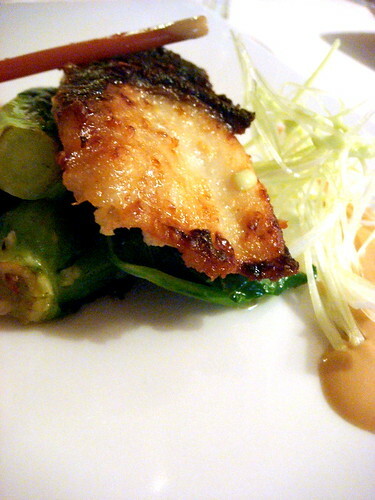 My favourite dish of the night was the Miso Marinated Black Cod. 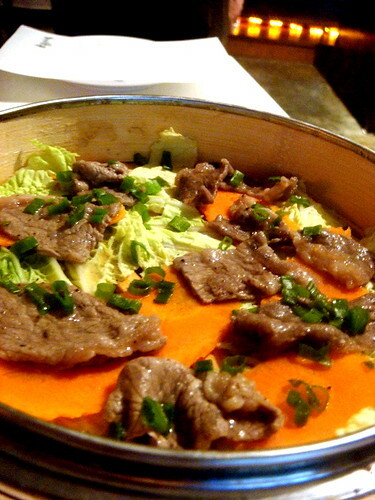 This dish has been my all time favourite mains in Nobu, LA, and at Hakka Republic they really do the dish justice. At RM55, it is worth every penny. The Slow Braised Black Angus Beef Cheek with Creamy Polenta was my least favourite dish of the lot. 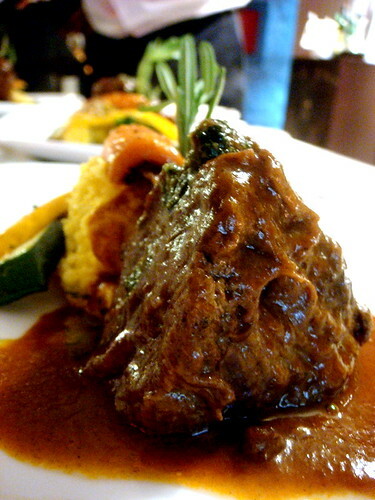 It lacked that robust, gamy taste that I’ve come to lust after/hanker for, in any good Beef Cheek.. know what I mean? 😛 Anyway, it was OK, but not something I would order again. Texture wise it was above average – wobbly with cartilage and smooth on the palate! This dish was priced at RM52. 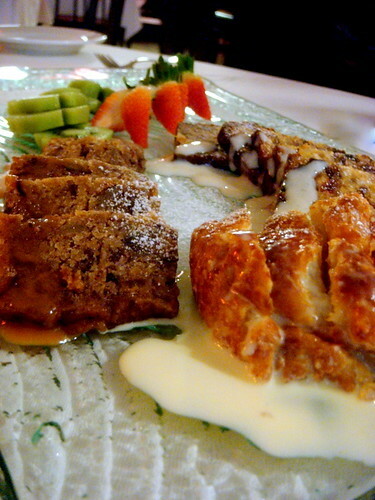 Desserts served were the Hakka Republic’s Special Rich Fruit Cake with Brandy Sauce, Sticky Date Pudding, Baileys Infused Croissant and Butter Pudding. Oh no! Do I have to be a wet blanket again and say that nothing on this platter really excited me all that much? Well, it’s just a matter of preference and I don’t really like fruit cake or dates or butter pudding etc etc.. give me chocolate cake, pavlova.. any-day I tell ya! Anyway, my dinner companions loved it so all I can say is that for the Fruit Cake lover, this would be a great choice! What’s better than beer on tap? Anyway, which ever genius invented this Enigmatic Enomatic machine… , He or She, should get an award! These wonderful wines by the glass keep well for at least 3 weeks. Well, here ends the wonderful dining experience at Hakka Republic. Of special note is that all the portions you see are really tasting portions i.e. smaller than the actual price size. We started off with Champagne, on to the lighter Whites and finally finished with a Full bodied Reds. This is probably why our meal tasted so good as well, because almost each course, had its own complimenting wine. To re-cap, The Steamed Wagyu was exquisite and the Chef’s recommendation of the Black Cod in Miso which was incredibly delicious. 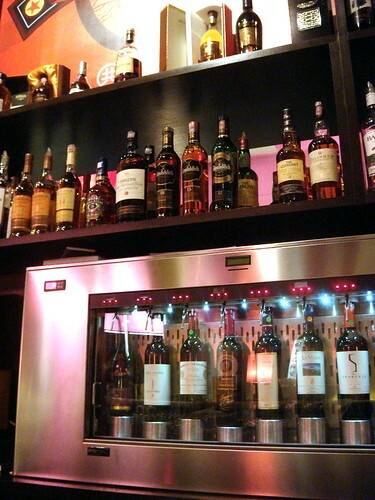 Hakka Republic has an outstanding selection of Italian wines and all in all, for what it is, the meal was really affordable. I would recommended this place to anyone who enjoys good food! 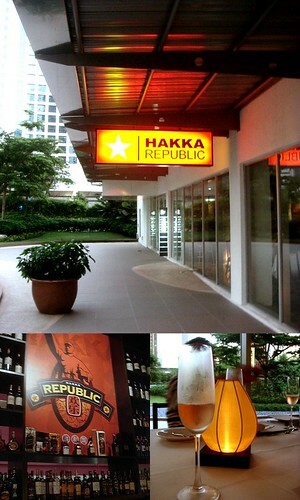 *footnote: Cheers Ryan Khang of My Nourishment and FBB for organizing this amazing dining experience at Hakka Republic! Next articleNadeje Patisserie on a Monday Morning. who needs whiskey on tap when we drink by the bottles anyways?? hahaha..
u didnt like the beef cheek?? aiyah shud hav pass it to me, i would hav gladly given u my fish..
hey, i think u're the first reviewer who didn't like the beef cheek (i recall reading that ll and joe both enjoyed it). i definitely wanna try it; most restaurants seem to serve wagyu beef cheeks, and i can't remember ever having a black angus version. ya lar.. what to do.. im the sorta gal who likes mah beef cheek a lil stinky and more gamy – like can smell the cow hide , if u catch mah drift..
whisky on tap… hmmm, can u imagine tasting every single malt by the glass, and i am talking high end here. But don't they serve whiskey/whisky by the shot already? Forgive me, but I don't normally buy single glasses. kekeke. Very nicely written, and just proves that one man's meat can be another man's poison, and that's okay, rite? ?…and nice pics too. Really wan. agree baybeh.. one man's meat! Turning on the tap of twelve 30yr olds? Kinkay. i ordered kampachi ( fish) for main course and when it came, it was lukewarm – which i thought it was not acceptabel for a fish dish – was it supposed to be served this way? The desserts were good though especially the fruit cakes. Well, can only drool at the photos. Only Keropok Lekor and Nasi Campur here for lunch. Looking forward to meeting up soon. Pink Parasol? Wow! so Boudoir a la Moulin Rouge. Interestingly, when I checked out the spelling for the word boudoir, it actually originates from the French word, Bouder which means to pout. Pouting in the Boudoir. Conjures up some fascinating images does it? alamak! 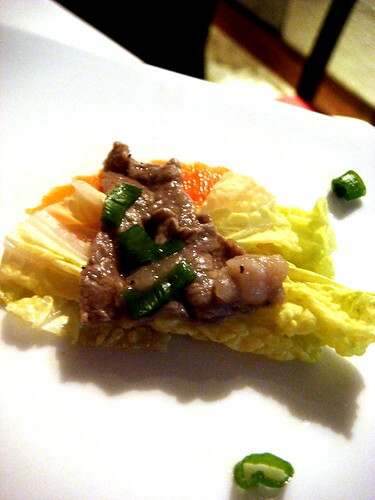 after masak-masak, lyrical lemongrass… now you had gone there as well. I was just talking to Jenn about going there one day only…hahaha!!! based on all your foods… and wines that accompany each food… how much in total??? erm, without the wines, approx RM100 per head. ok or not? Woohoo! Your pics are absolutely gorgeous le. tQ Qmonkey.. come back soon! Isn't this enter da Republic somewhere between Austilaria , Mongigolia & Uburkisstanis , whence sprout forth these exquisite gems of fine under the fabled track power inspirations to keep you ahead , for more & longer & de nex future high love runs of pure joy & pleasure ? 3 Top Malaysian Desserts to Make & Eat!